"ON" (activation), with front passenger or "forwards facing" child seat, "OFF" (deactivation), with "rear facing" child seat". B. Front passenger’s airbag deactivation indicator lamp. 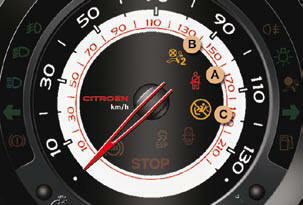 C. Front passenger’s airbag activation indicator lamp. 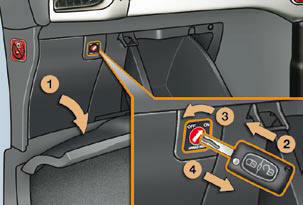 The lighting of the indicator lamp indicates the status of the corresponding function. 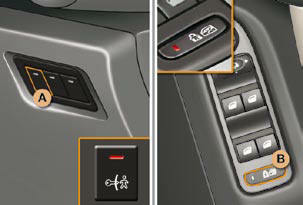 B. Deactivation of the rear door and rear elecric window controls.